Rachel Kushner has leukemia. She's the dying girl in Me and Earl and the Dying Girl, directed by Alfonso Gomez-Rejon (former assistant to Martin Scorsese) and based on Jesse Andrews's 2012 novel. As the title suggests, the three central characters are "Me," Greg Gaines (Thomas Mann) and, as the grammar suggests, the film's principle, somewhat self-absorbed character; Earl (RJ Cyler), Greg's artistic collaborator and lone friend; and Rachel (Olivia Cooke), that groan-inducing stereotype, the dying girl. Greg is the archetypal, adolescent misfit. He deals with his outsiderness (which is to say his intellect and talent) by adopting the tics and lingo of every high school "tribe" in an effort to earn a measure of acceptance from all while belonging to none. Greg's father (Nick Offerman) – a traveled social anthropologist who, now that he has settled into academe, spends most of his time at home outfitted in ethnic garb he wears like bathrobes while preparing exotic foodstuffs for Greg and Earl -- has probably, unwittingly, fostered his son's defensive social technique insofar as he is himself a student of tribes. Greg's father also has amassed an impressive library of classic and foreign films that Greg and Earl have been weaned on, leading to their shared obsession with movies to which they pay homage by making spoofs, hundreds of them: Monorash (Kurasowa/Akutagawa), The 400 Bros (Truffaut), A Sockwork Orange (Kubrick/Burgess), Death in Tennis (Visconti/Mann), the hilarity of the list goes on. Greg and Earl seek refuge during high school lunch hours in the office of history teacher Mr. McCarthy (Jon Bernthal) where they watch his equally impressive video library, replete with Werner Herzog documentaries, among other arthouse fare. Mr. McCarthy – hip and tattooed – daily exhorts his students to "Respect the research!" And there's Rachel, a somewhat introverted, self-deprecating young woman who is, well, dying. Greg's mother (Connie Britton) insists the reluctant Greg spend time with the stricken former schoolmate in a not quite pity party sort of way. Once Greg has re-acquainted himself with Rachel and her mother, Earl naturally enters the circle. New York Times critic A.O. Scott describes the movie as a "terminal teen melodrama, a bittersweet coming-of-age story, a wistful tale of interracial friendship." He notes that "On paper, Mr. Andrews's book is lovely: sensitive and rueful and attuned to both the solipsism and the ethical seriousness of adolescence." Rolling Stone's Peter Travers writes that the film "deserves to be the summer's sleeper hit. It's that sharply funny, touching and vital." Writing for The Guardian, Ed Gibbs calls it an "inspired, insightful romp…. [....] The casting is excellent… and the script is sharp and authentic." Sheila O’Malley writing for rogerebert.com hates, hates, hates the film, which is unfortunate because I have read enough of Ebert's criticism over the years to be almost certain he would have liked it. Gomez-Rejon’s film is much more than a terminal illness movie, and therein lie its rewards. To that end, I am most interested in Richard Brody’s review for the New Yorker, "What's Missing from Me and Earl and the Dying Girl." "What are movies for, what can they do, why make them?" Brody asks by way of introduction. 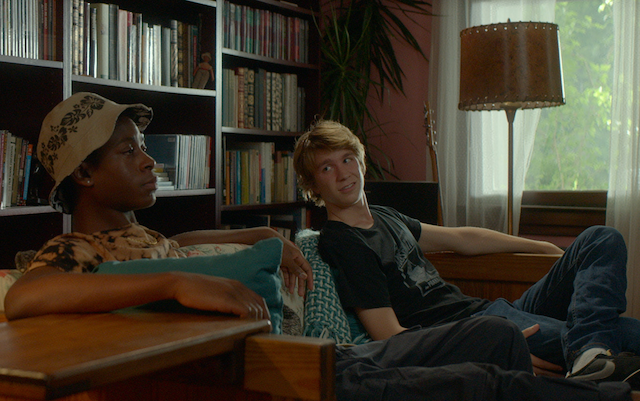 "That is the central subject of the new teen drama Me and Earl and the Dying Girl, which is a movie of amiable sentimentality and considerable skill, but of canned sensibility." From there Brody's essay is divided almost exactly in half. The first half concerns his quarrel with the film, encapsulated in his New Yorker title "What’s Missing…," to which I would argue that the rejoinder to part of this quarrel is planted squarely in the title of the film. "In a way," Brody says, "the movie is the story of three bedrooms, two of which – Greg's, and that of the 'dying girl'…– are seen, and one of which, Earl's, is not." Brody sees the depiction of Greg and Rachel's neighborhood as comfortably middle-class and white and Earl's as dilapidated and poor, a risky place Greg is loath to visit, as a sociological stereotype to which Hollywood is prone. Point taken, but he goes on to extrapolate that "Greg doesn't know anything about Earl and doesn't bother to ask." We are made well aware that Greg and Earl have known each other for years; we're only seeing the slice of their lives they share with Rachel. Furthermore, the self-absorbed teen has been a staple of American literature at least since Holden Caulfield, so I find this criticism unduly harsh, and though Earl is the more emotionally sensitive of the two friends, he is an introvert himself. Brody also complains that "only Greg, the movie's first-person character, gets a voice-over, not Earl or Rachel." Did Billy Wilder slight Norma Desmond by giving all of the voice-over to Joe Gillis in Sunset Boulevard? Should Alvy Singer and Annie Hall have engaged in parallel points of view with the audience? Somehow I don't think so. In Ancient Greek theater the protagonist is not simply the principle character, but the character with whom the audience is meant to identify and who undergoes some change through the crucible of conflict. The deuteragonist is the secondary character, who alternately acts as the protagonist's ally and challenger, depending on the deuteragonist's own conflict. The tritagonist is the tertiary character, who prompts the protagonist's empathy. Me and Earl and the Dying Girl is about Greg. It is not about Earl nor is it about Rachel the dying girl, except insofar as these two characters fulfill their classic dramatic roles and additionally round out the meditation on adolescence. In that regard at the very least, the film deviates from the dying heroine trope, which trains its sights on the suffering heroine. But Me and Earl and the Dying Girl is about something bigger than Greg, and to this, Brody directs the second half of his essay. The unattainable object of Greg's young affections, Madison (Katherine C. Hughes), suggests, "in a plot twist," says Brody, "that's the most significant matter in Me and Earl and the Dying Girl" that the cinéastes make a film for Rachel. Surely Me and Earl and the Dying Girl has already been added to searchable Internet lists of self-reflexive movies, and indeed, the plot explores three cinematic storytelling modes (Brody calls them "genres"). "There are, first," Brody notes, "the parodies that Greg and Earl make together…. Then there's Greg and Earl's first stab at a film for Rachel, a documentary tribute…. And then…there's the film that Greg makes for Rachel, on his own, without Earl's involvement [….] an abstract animation. [….] It's a highly labor-intensive film that reveals devotion, imagination, craft, skill, and discipline. It also suggests, in its abstraction, the unrepresentable enormity of Rachel's situation. ([I]n 2006, the late musician Ornette Coleman told Fred Kaplan, 'This term abstract art—what it means is something that causes you to see more than what you're looking at.')" Brody is writing for a major publication that probably has a policy against spoilers, so he leaves it at that, but the film's coda is the grail of its trajectory. Three narrative scraps will come together to become the wonderment of the film's close. The first is a throw pillow. On his initial foray into Rachel's room, Greg makes the small-talk observation that Rachel has a lot of pillows. The second is Greg's mother prodding him to pore through an encyclopedic catalog she foists on him of America's colleges and universities. Over the course of the year, however, preoccupied as he is, Greg ceases to engage academically, and the college that had accepted him must subsequently reject him. He gives the college guidebook to Rachel, something as a talisman of both hope and hopelessness. Thirdly, during the course of their failed documentary attempt, Greg and Earl interview Rachel's mother, who describes Rachel's reaction to her parents’ divorce. Rachel, her mother reveals, has a seriously destructive streak. She took all of the books in the house and hacked them to pieces with scissors. Two parallel narratives are interlaced in Tim O'Brien's masterwork The Things They Carried, both about love and loss. The first story – and The Things They Carried, if it is about anything, is about the primacy of storytelling to the human condition – is a war story, specifically a Vietnam war story: "In any war story, but especially a true one, it's difficult to separate what happened from what seemed to happen. What seems to happen becomes its own happening and has to be told that way. The angles of vision are skewed. When a booby trap explodes, you close your eyes and duck and float outside yourself. …[T]he pictures get jumbled, you tend to miss a lot. And then afterward, when you go to tell about it, there is always that surreal seemingness, which makes the story seem untrue, but which in fact represents the hard and exact truth as it seemed." The parallel narrative in The Things They Carried is the narrator's reminiscence on his childhood – specifically his first, deep love, Linda. Linda has leukemia, and senses Tim's apprehension about her impending death. In her nine-year-old matter of factness, she tries to console him: "Well, right now I'm not dead. But when I am, it's like... I don't know, I guess it's like being inside a book that nobody's reading. [....] An old one. It's up on a library shelf, so you're safe and everything, but the book hasn't been checked out for a long, long time. All you can do is wait. Just hope somebody'll pick it up and start reading." At Rachel's Shiva, Greg steals up to her room, ostensibly to take a particular one of those pillows. Once there he sees that college guide doorstop of a book, and he picks it up. Inside, what he finds is Rachel – or something larger – Rachel's inner, creative life. Only in the final scenes do we – and Greg – come to understand that Rachel was an artist. She painstakingly cut each page after page of book after book, Greg finds, to layer each into a three-dimensional world. Indeed, she has turned her entire room into a realm of her creative imagining. Me and Earl and the Dying Girl comes at the deathbed heroine obliquely and slips her into something else, something larger, something profound. Early on Greg tells us, "So if this was a touching romantic story, this is where our eyes would meet and we would be furiously making out with the fire of a thousand suns –––– but this isn't a touching romantic story." It is a story about agape and about the redemptive power of art – the art of movie making, the art of sculpture, the art of college entrance essays, the art of the stories we tell. In the decades that I taught freshman English, I was repeatedly struck by the preponderance of literature that explores the failure of human communication, and yet, there I found myself, day after day, standing in front of a class full of people with 300+ pages of words in my hands. Is there any more eloquent a testament to hope than the efforts of one human being after another – using every trope, every medium in the arsenal – to try to craft meaning in the midst of despair? This essay is followed by a companion essay, "The Sentimental Journey of the Dying Girl." Charles Ealy provides “A Guide to Fun Movie References in Me and Earl and the Dying Girl” in Austin 360, but to peek before you see the movie would be a real spoiler.